A collection of the Various Kata for chanting and praying to Jing Jok Amulets. The Jing Jok is a very popular amulet in Thailand with both Male and female devotees, probably not only due to its great power to attract wealth and admirers, lovers and money, and protect from Black Magic and Evil Spirits, but most probably also because of the easiness of use, which makes the Jing Jok a powerful Magical tool which needs little extra work to coax into performing its duty. Simple Kata Chanting is enough normally to induce the power of the Jing Jok to attract lovers and customers, or to prevent Black Magic attacks. There are a multitude of different Wicha, and a large array of different shapes and sizes of Jing Jok used for different kinds of spells. Mostly they are of the Maha Sanaeh and Metta variety, but there are also pro-active Gecko amulets as well as those intended for more protective purposes, depending on the construction and empowerment of the spell. 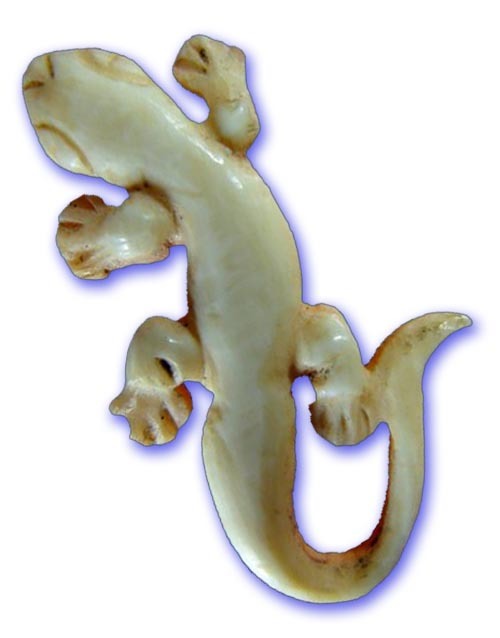 The ‘Jing Jok’ (Gecko) is a Magical Animal that has dominated Thai Mythical beliefs since the Pre Buddhist Times of Animism. In Olden Times, Thai people would say that if you hear a Gecko greet you when you walk out of the house to go out, that you will be befallen by good luck, and have all the boys or girls you want running after you, have lucky windfalls, and other auspicious blessings. 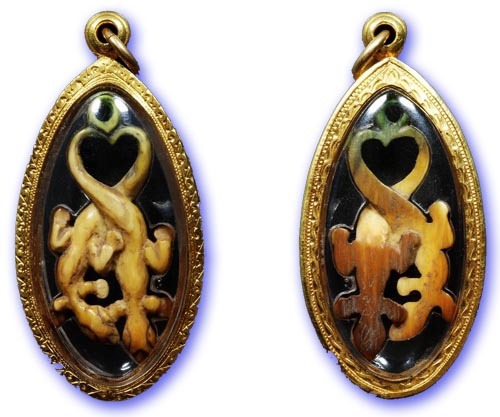 The Gecko is also a powerful protection against Black Magic, for the Sorcery within the Gecko itself is so high as to prevent any other Dark Sorcery from entering the sphere. The Jing Jok is a highly reputed amulet used for increasing your Gambling Fortunes, and is one of the favorite talismans of the perpetual gambler. Its power to improve Business Talks and Commerce (sales), is Famous. In addition, the Jing Jok is pure Metta Maha Niyom, and Maha Sanaeh, and has been the favorite Love Charm of many generations of Thai people, and seems to be holding its place as the most popular Love, Commerce and Gambling charm. The Jing Jok is however not only able to bring Lucky Fortunes and Love to its owner, but is also powerfully endowed with Kong Grapan Magic to protect from deadly accidents and harmful attacks. Anti Black Magic is inherent within the Gecko Wicha too, and keeps any Curses or Dark Sorcery at Bay. Chant Maha Namasakara 3 Times to Lord Buddha First (Namo Tassa). The Most famous of all Masters for Jing Jok is most certainly Luang Phu Hnay of Wat Ban Jaeng in Ayuttaya, and for Tugkhae is most definitely Luang Por Kreun and his Looksit Luang Por Lum, of Wat Samakee Tam. Being a Prai Spirit Animal, the Jing Jok must be brought into the home using the same method of invitation as other Prai devas and Spirits. Before bringing the Jing Jok into the home, light 5 Incense Sticks and inform the local spirits of the arrival of the Jing Jok as a member of the household. Then light a further 16 sticks of Incense and inform the Higher Celestial Guardian Devas.